As I am sure you have all noticed, there has been a lack of staff activity as a whole, not to slate the current staff team, it's just the playerbase is increasing daily and we need to upkeep with helpers and staff along side that so for those who are looking to become an active & friendly staff member and you are active, please apply below using the correct format. How many hours can you put in per week? : 50-60hrs. Not an issue if need more. Past experiences as staff? : Have been mod and support for smaller sized/new rsps that have died out. Why do you think you should be promoted? : I believe i should be promoted because like Subarashii there isn't much staff activity going on. Especially in the graveyard times when most of the staff members are asleep and there's nobody coming on till the morning to help players in need. I would remind and enforce the rules to players on a daily basis when certain situations or problems would occur, and make sure to handle situations in a respectful and professional manner. I would say i'm a pretty decent and easy person to talk to. I always try to diffuse and avoid arguments and make sure the problem does not happen again. I know if i was given a chance to be on the staff team i could be a big help to the lack of staff activity and also a big help to the new players joining the game on a daily basis. I am very updated with all of the prices and features that dawntained has to offer so it would be very easy for me to help new players enjoy dawntained to the full extent and answer any questions they might have. My activity on forums is not great but I am certainly willing to be more active in forums and just as much in game to improve and assist. Everyday i'm learning new things to help other players and I always try to help players with the best of my abilities. And i know if i was given a chance to be part of the staff team i could do so much more for our server. Thanks for taking the time to read my application, and i hope you'll consider! Past experiences as staff? :on 4 servers one was with 400+ players 2 year ago. Past experiences as staff? : i have coded, modded, supported many servers in the past including my own that go up to a population of 60, but didnt have the time to let it grow. @4kiezer na what? on screen shots? questions they may have, as well as enforce the rules without prejudice. and doing the best job I can possibly do. to ensure that dawntained continues to grow and is the best rsps on the market! How many hours can you put in per week? : 35-40 sometimes 12+ on weekends. Why do you think you should be promoted? : Enjoy helping, Enjoy seeing people satisfied after being helped, I know this server very well, mostly everyone knows me or knows of me, i am trusted, have never will never scam for any reason. ive had some bad days on here, but ive cleaned up for the most part, reason why i am giving this a shot again, i can shoot the standards of what a moderator/support should be and do, i set the bars higher than what they need to be. I do not take sides due to friendships, right is right, wrong is wrong. Punishments should and will be given to anyone who deserves it. I know what it takes to keep people here and to also to bring more into the game. I am available to host events for the community and to make the server all around more fun for the people, i can help clean some of the toxicness up, i like to be able to help dawtained grow further and be better. Past experiences as staff? : Yes, Soul split helper, recklesspk moderator, fatality614 moderator, Rovascape Moderator then promoted to admin, Was active staff for more than 2 months + on all these servers. But these servers simply do not exist anymore. I was never demoted from any of them. Why do you think you should be promoted? : I've dedicated tons of time to helping others and I would be able to better serve that purpose through the role of a player moderator. Past experiences as staff? : Been a mod for a few past RSPS like RSPS-PK and OS-Scape a long time ago. Between 40-55 hours a week is definitely a realistic estimate I'd say. My name is Frederik - And I am 22 years old. I'm a genuine guy. What you see is what you get. There are for sure some other good appeals in here with people having loads and loads of ingame experience. I might not have AS much experience as them but I still have alot. Been playing Dawntained for a year now and I still love it as much as I did when I first started. 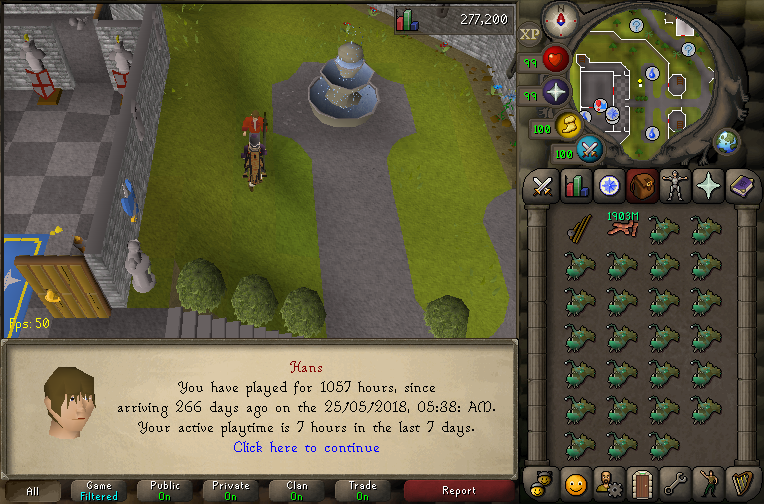 Been playing Runescape since 2008, that's where most of my ingame experience comes from. To me, being a staff member isn't just about having ingame knowledge, it's also about being mature enough to carry that responsibility you "sign up for" and knowing how to be professional in different and needed situations. This is something I'd take very seriously and treat with the highest respect. Being a face towards the community is something I deal with every day as a Service Technician at Tesla. I deal with customers multiple times on a daily basis where being a professional is key. Knowing how to talk to people in different and sometimes good or bad situations is key. Making the right decisions as I move forward is an everyday thing for me. I'm a fun, humorous and humble guy who loves to have a good time both in and outside of the game. All this gives a super reliable and strong personality that would suit the staff team of Dawntained perfectly. For further questions, please feel free to reach out to me! I’ve been on this server for a while now and don’t think there 're much secrets left to discover. It would be my pleasure to help new and not so new people discover this server. I’ve had great help from the staff when I first started and would like to return the favor. I remain calm when problems arise and take time to figure things out before taking action. Past experiences as staff? : non, eagar to learn. Thank you for taking the time reviewing my application and don't hesitate to reach out in case of questions. Which times of the day are you usually on? (Use your country's clock as reference): After my work, I spend most of my time on Dawntained. SO from 16:00 - 23:00 a week. At the weekend I am usually around the 10h online per day. How many hours can you put in per week? : More as 30 hours. Why do you think you should be promoted? : I like helping the community to keep Dawntained up. There is nothing better for me than helping other people enjoy the game. I am very helpful and open to everything else. Past experiences as staff? : Once upon a time, I was a supporter on an Eco 719 Server. Was promoted to moderator after a while, unfortunately, then the Server was closed because of inactivity. Which times of the day are you usually on? (Use your country's clock as reference): GMT -5 2pm-6am varies depending my work. I can be on anywhere from 40-60 hours a week depending on what is going on in the week. I believe I would be a great add to the staff team because I am friendly and very helpful. When I am online skilling or just talking to friends I love to help anyone that has a question on yell or the CC, I try my best to help them with my knowledge of dawntained. I also think I would be a great add because of my activeness. I've been a mod for a server called legacy614 (closed) back in 2012 I later resigned because I had no internet/moved. I also was a helper on ultimatescape3 (closed) I resigned because of a family issue that was happening at the time. I usually am online around early morning to late night except for monday wich i can only play during the night. I try to get atleast 40-60 hours per week but im usually on way more than that. I'm an active member of the community and try to help all new and old players the best i can. I love interacting with new players and the community in general. I put in alot of hours in the game and help alot of players when im online. I try to pass on all the information that i know and learned over the past year that I've played this server. I'm usually online when there is no staff online but needed. I dont have any experience as a staff member on any servers yet but I'm sure that if i get the chance i will do great!